Bruno Mars is arguably the most speculated name on the world pop music community, where he emerged seemingly out of nowhere. The unbelievable success of the singer’s debut long player, Doo-Woops & Hooligans, established his place in the hierarchy of popular performers and proved that his first achievements had not been accidental. Seven Grammy nominations is a figure telling the whole story. The then young artist took a very short while to transfer from the division of the promising and talented into the league of stars with unique artistic style. Let it be reminded that Bruno is also a prolific author who has contributed to the writing for a long list of remarkable musicians, including Justine Bieber, Alicia Keys, and Cee LoGreen. Therefore, anticipating the release of Bruno’s sophomore album, the audience expects him to deliver a confident work in his signature and elegant manner. 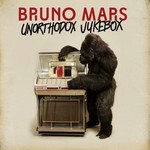 The new record was issued shortly before the end of 2012, under the title Unorthodox Jukebox. Some would see the moderate length of the Unorthodox Jukebox set featuring only ten tracks, as a gesture of disrespect or even an outright rip-off act. Yet these thirty five minutes are exactly how much Bruno Mars needed to make his powerful music statement which leaves grey suspicions, acute accusations and straightforward resentment in ruins. He played and sang what he wanted to, and he did it in the way he wished, and this makes it sure that Unorthodox Jukebox was released in its purest, original form, the one the singer had seen it in his mind all from the start. The risky, yet brave and, as it would become clear later, justified move was to make the second album something different than an advertisement to his name, a shouting product with indisputable hits and other tracks highlighting their superiority, to make it a collection of solid songs, each worthy of your attention. Unorthodox Jukebox is an amazingly level work where each track is just as good as another, the one that celebrates the variety of Bruno Mars’ musical preferences. The shadow of Sting and Police comes and go all over the record, but it rules totally in the single Locked Out Of Heaven. Vintage synths decorate the R&B interior of Moonshine. Michael Jackson’s infectious rhythms and tongue breakers penetrated Money Make Her Smile. Bruno Mars could have delivered a sequel, if not a copy, to his debut offer, but Unorthodox Jukebox has totally different goals. Whereas two years ago the young musician was attracting the audience trying to prove he was capable of making hit material, now, working in a completely new status, he does not want to make friends with the public, but states what he intends to perform. At times, this demonstration of his liberty tale ugly forms as he uses too much strong language or gets too explicit while discussing relations between sexes, like he does in Gorilla. However, the singer seems not to care about that too much. And the confidence with which he performs each track on the fresh album, his awareness of what everything should sound like here conquer listeners at once. It feels like there is no genre Mars could not work with, and the only condition is that he must like it. The so different pop-ballad Treasure, funk and blues Natalie, impeccable piano soul When I Was Your Man somehow form a stylistic unity that is known and accessible to Bruno alone. Unorthodox Jukebox may scare off those who hoped for the singer to release another collection of hits, but fascinate those who believed in his song-writing and artistic genius which would help him erase the border between the past and now.